DOYLESTOWN, Pa. (KFSN) -- A jailed man who has been the focus of an investigation into the disappearances of four men admitted on Thursday that he killed them and agreed to plead guilty to four murder counts, his attorney said in a surprise development. Cosmo DiNardo, 20, confessed to the commission or participation in four murders, attorney Paul Lang said outside court, where DiNardo had met with investigators. DiNardo also told investigators where the bodies are. "I'm sorry," a shackled DiNardo said as he left the courthouse. In exchange for the cooperation, Lang said, prosecutors were taking the death penalty off the table. There was no immediate comment from prosecutors. The mystery of the four men's disappearances has transfixed the Philadelphia area over the past week, taking a grisly turn when human remains were discovered in a 12-foot-deep grave on a farm. But what sort of evil befell them, and why, had remained shrouded in secrecy. The prosecutor, who has held twice-daily briefings, made it clear Thursday he knew a lot more than he was saying, citing the need to protect the investigation. That only added to the speculation and rumors before DiNardo's confession. "It's been very unnerving. It's very spooky," said Laura Hefty, who lives a few miles from the gravesite in Solebury Township, where farms bump up against new residential developments. Many people, she said, were trying to convince themselves this is nothing that could ever happen to their kids. "They feel incredibly sad. Some people are pretty angry, too," and are asking, "How did it get this bad?" she said. 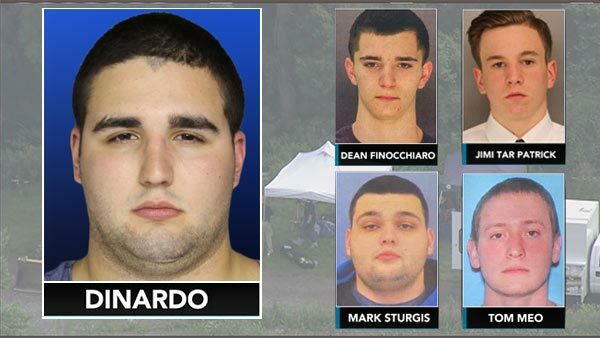 The four men, all residents of Bucks County, disappeared last week. At least three knew each other. The remains of only one, 19-year-old Dean Finocchiaro, have been identified, though authorities said other remains were found in the hole as well. DiNardo, the son of the farm property's owners, was being held on $5 million cash bail before his confession, accused of trying to sell one of the victims' cars. District Attorney Matthew Weintraub parried one question after another by saying he couldn't - or wouldn't - answer. Police were back at the farm Thursday, digging away in the dust and the 90-degree-plus heat and using plywood to shore up the deep, tent-covered trench that they excavated at the spot where Weintraub said dogs managed to "smell these poor boys 12 feet below the ground." For days, TV news helicopters trained their cameras on the excavation, creating an unsettling racket but allowing the public to follow the forensic work from their office computers. On one day, viewers could watch investigators haul up buckets of dirt and sift it through hand-held screens in what looked like an archaeological dig. The other missing men were Mark Sturgis, 22, and Thomas Meo, 21, who worked together in construction, and Jimi Taro Patrick, 19, a student at Loyola University in Baltimore. Patrick and DiNardo had attended the same Catholic high school for boys. The story has been corrected to show the name of the first neighbor quoted is Hefty, not Heft, and that Patrick's middle name is Taro, not Tar, as prosecutors had reported.